The District 5 Senate race is shaping up to become one of the more tightly contested state-level political battles in Maine. The Democratic incumbent seeking reelection, James Dill, beat out Republican challenger Mitchell McLaughlin with nearly 55 percent of the vote in 2014, but the race this November should be much closer. This is because, despite his popularity amongst District 5 voters, Dill is battling a wave of conservatism that has enveloped much of Maine’s 2nd Congressional District, where the towns Dill represents all reside. Recent polling has shown that many 2nd District voters are favoring Republican presidential candidate Donald Trump and incumbent Rep. Bruce Poliquin, who is running a reelection campaign against Democratic challenger Emily Cain for the 2nd District House of Representatives seat in Washington. It is even speculated that Trump will earn one of Maine’s electoral votes by winning the popular vote in the 2nd District, splitting Maine’s electoral votes for the first time in history. Inevitably, the question becomes whether District 5 voters will vote Republican all the way down the ballot, giving his challenger a sizeable advantage in November, or if they will change course and cast their vote for Dill. “He may have an advantage that way if people don’t know me. But, if people know me and they get down to that level [on the ballot], I think then they start to say, ‘Oh, this is Jim Dill,’” Dill said. Making friends on the other side of the aisle has never been trying for Dill. According to him, legislators in both parties often ask jokingly which party he truly belongs to. “I’ll tell you, I’ve been called Republican more than once by the Democrats down in Augusta. I get that from both sides. But both sides talk to me, and I think that’s a good thing. It’s almost like being an independent, but both sides respect my opinion,” he said. Dill says that during his time as a legislator, he has always considered the views of his constituency. If they endorse bills supported by his opponents, Dill is not afraid to vote in favor of them. “I’m going to do what the constituents back here say. That truly will put me at odds with the Democrats, because very often, I’m the only one that votes with the Republicans,” Dill said. Dill gets this badgering from his peers in Augusta because during his time in the legislature, he has been effective in representing his district and voting for initiatives endorsed by lawmakers on both sides of the aisle. Dill even has a “B” rating from the National Rifle Association. Despite the surge of conservatism in his district, Dill believes he represents his constituency well, sharing an anecdote that describes what most would consider a political anomaly, but has been seen more frequently from voters since Dill first joined the legislature in 2010. “I don’t know if you’ve seen the signs on College Avenue in Orono or across from Hannaford, there are two Trump signs on this one lawn — two Trump signs, a Poliquin and a Dill sign, all on the same lawn. Republicans vote for me,” Dill said. According to Dill, he gets along well with Republicans because he never labeled legislators by party affiliation when he first got to Augusta as a member of the House of Representatives. “I think that very seriously, I’m just a people person and I don’t label people right from the beginning. Because of my job, I’ve worked with a diverse group of clientele. When I got down to Augusta, I saw it no different,” he said. The constituency of District 5 is one of the most diverse in the state in terms of political ideology and is in some ways reflective of Maine’s north-south dichotomy. 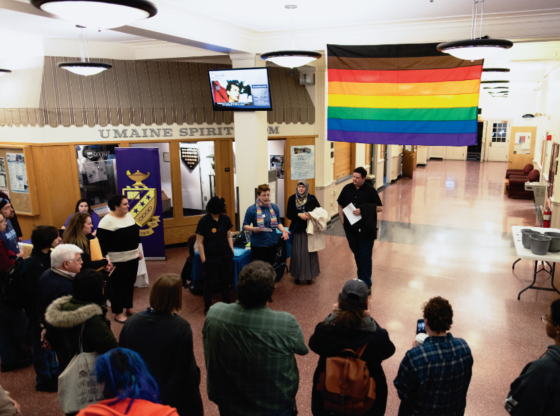 The district is home to UMaine, the state’s largest public higher education institution, which creates a hub of left-leaning voters that advocate green and progressive policies, similar to southern portions of the state. This area is composed of young adults and other people looking to start their professional careers, as well as those associated with academia. However, the rest of the district is made up primarily of former mill towns, which have aging populations that worked for most of their professional careers in paper mills. This is largely the blue collar voting bloc that has aligned itself with Trump and Poliquin in recent polling. “You almost have two entirely different groups in political ideology. I do have to walk this line, and it’s probably the same line I walk in Augusta. Being a moderate, neutral type of person that’s willing to listen is the key,” Dill said. Dill, a resident of Old Town, has a long history of involvement in the greater university community. Most have likely seen Dill ushering at UMaine sporting events, as for more than 20 years he has been a member of Orono-Old Town Kiwanis Club, a community volunteering organization, serving past terms as president and vice president. He has also served on the RSU 34 School Board for 20 years, 19 as the chairman, and has served on the school board of the Career Technical Education school in Bangor called United Technologies Center for 20 years, and has chaired that board for the last six years. “Gone are the days where you finish high school and get a job in the mills and have a good career, a good paying job,” Dill said. Dill is also employed as a Pest Management Specialist for the University of Maine’s Cooperative Extension, and is also a cooperating professor in the School of Biological Sciences at UMaine. Dill’s challenger, however, has been just as involved in the greater Orono community and for just as long. Republican District 5 candidate Brett Baber is a practicing lawyer of Lanham, Blackwell & Baber in Bangor and has more than three decades of experience in helping the people of Maine. “I’ve been helping people solve problems for over 30 years and with my work, it’s on the micro level, per individual, and very rewarding. I think I can apply my problem solving capability, in addition with my legal background, as a way to get along with everybody in the legislature,” Baber said. Baber graduated from the University of Maine Law School in Portland in 1985. He joined a law firm in 1988 where he started as a defense lawyer doing automobile collisions and accident work. He also represented employees who had been involved in discrimination lawsuits early on in his career. From 2000-2007, Baber ran his own practice before joining Lanham and Blackwell in Bangor, becoming a partner after just one year. From 2003-2007, Baber also served as the attorney hired by UMaine’s Student Government, providing legal services to undergraduate students. 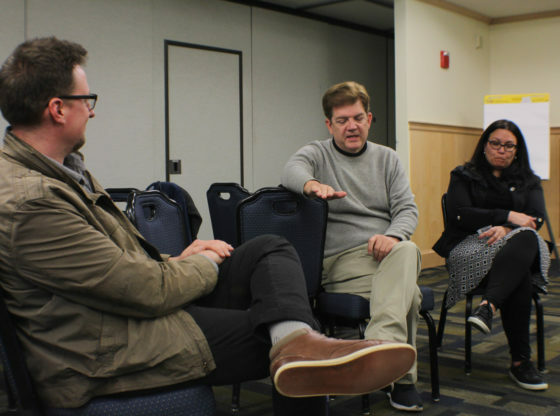 During this time, Baber became well acquainted with a large portion of the student body and gained a sense of the most important issues facing members of the community. Baber is a member of the Knights of Columbus chapter in Bangor, a fraternal charitable organization. Additionally, since 2003, he has volunteered as the public address announcer for various UMaine sports teams, including hockey, football and basketball. Unfortunately for Baber, he has had to put his volunteering efforts on hold this season for his campaign. “One of the downsides to running for office is I had to give up my work as the public address announcer for football. I love football, and I love doing both men’s and women’s basketball,” Baber said. Given his years of involvement at the university, which he refers to as an “engine of economic development and excellence” for the state, Baber considers the millennial voting bloc crucial to his campaign. Understanding that the university community is likely more ideologically aligned with his opponent, Baber wishes to build relationships between local employers and UMaine students to bridge this divide, using research and analytics available at the university to tackle real world problems. “Those are engineering problems, and we have great engineers here at the university that could be working on those and really benefit the state. We have some great advantages, and we need to talk about them. We have the tools to get these things done, but we have to do it together,” Baber said. Baber is firm in explaining his belief that the Maine legislature is in need of a shakeup. The slogan of his campaign is “it’s time to think differently about government,” an idea he truly endorses. Baber wishes for District 5 voters to consider his role as an outsider with new perspectives when casting their vote. “We see too much of the playground politics at various levels of government right now, and I believe we need to get beyond that for the good of the people,” Baber said. “As a bit of an outsider, I can try and stir things up a little bit. I think we’re in desperate need of restructuring of government, both at the state and local level,” he added. Baber promises to bring original ideas and perspective to the legislature, spurring conversations on new ways to save money and spend more effectively in Augusta. Baber discussed Maine’s reliance on local government over strong county governments, and the potential money we could be saving if schools and other structures of society were centralized to counties rather than individual towns. “Most states have strong county governments while in New England, we have town government more so, and we’re paying the price for that. We may need to revisit whether we want stronger county government, and that’s an area where new perspective may change things,” Baber said. Baber became motivated to run when he started to believe that the pendulum began swinging against business and entrepreneurship and too far in favor of taxing and spending. In his bid for the Senate, Baber hopes to better facilitate the relationship between regulation and business to bridge the economic divide between poor and middle-class Mainers. To do this, in Baber’s view, we must reduce the footprint of government, which he says is in stark contrast to his opponent’s ideology. “Tax and spend just doesn’t work. While I respect Jim [Dill] and his approach, I think philosophically, he’s a member of a party that has an approach now that doesn’t serve the people of Maine well,” Baber added. To better serve District 5 constituents, Baber suggests lowering taxes, energy rates and regulatory hurdles, which combined would significantly reduce the overall footprint of government. Perhaps the most refreshing aspect of the District 5 race is its civility. Neither candidate has a PAC running negative advertisements in television commercials or free ad spaces available in local publications. Baber and Dill do not want to engage in any rhetoric outside of their individual messages and only seek to distinguish themselves on policy alone. In fact, both candidates have also spoken increasingly high of one another since first meeting at the inaugural Memorial Day Parade in Old Town. “I was reminded once I saw him [at the parade] that he was the fellow I always see ushering at the football and hockey games,” Baber said. “We can be civil and talk to each other. We can get along and respect each other as candidates. Let’s distinguish ourselves on policy,” he added. Dill echoed the same sentiment. “It’s who we are as individuals. He had an editorial in the paper about civility and I think if you look at me down there [in Augusta], or anything I write for the papers, I don’t bash anybody. That’s not my style,” Dill said. “We haven’t talked and agreed, that is just who he is, and that’s just the way I am. I don’t attack people because I don’t believe in it, and [Baber] doesn’t either,” Dill added. Unlike what can be seen from the 2nd District House race between Poliquin and Cain, neither candidate is interested in political mudslinging and both worry of the negative effect it has on politics and civic engagement. Dill shared a story of constituents he spoke with more than a year ago in Millinocket, who despite the depressed condition of their once-vibrant mill town, only wished to discuss with him their frustration with the negative advertising campaigns PACs are running against Poliquin and Cain in the 2nd District. In that moment, Dill learned that negative advertising is not the way to win over Maine voters. “If anything, I think it just hurts you. I don’t think the negative ads help any one candidate at all, because the people of Maine don’t like it,” Dill said. 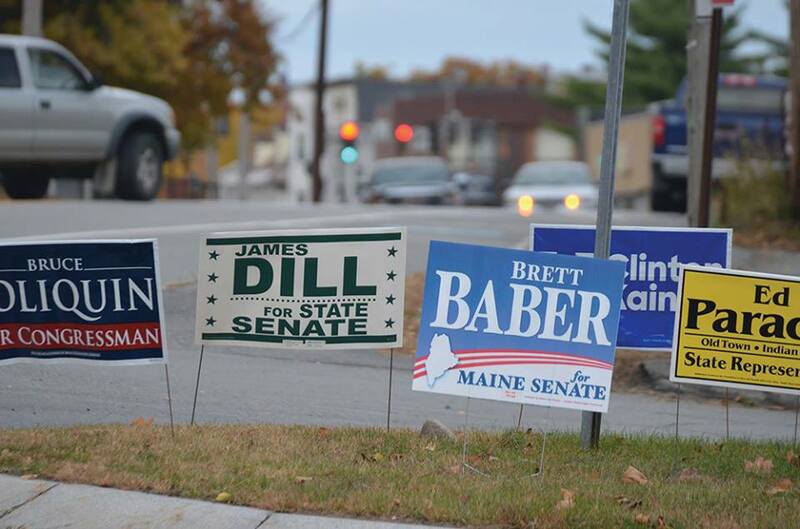 Dill and Baber have vastly different outlooks on the five referendum questions that Maine voters face in November. Dill supports all of the ballot initiatives but Question 3 and 5, but supports Question 2 and 4 with reluctance. Baber intensely opposes all of the ballot initiatives, giving them his own nickname. “All of these questions sound well intentioned, and that’s why the public polling is running in favor of the ballot questions. I call them ‘The Bad 5.’ If these are enacted, Maine is going to be in serious trouble,” Baber said. “We might withstand one or two getting into law, but if all 5 get enacted, our economy will be heavily impaired,” he added. Baber also made clear his dissatisfaction with the attention Maine’s citizen referenda system gets from outside interest groups that try to change the way Mainers live their lives. “There’s a lot of out of state money coming in to fund these questions, and that’s a problem. Mainers don’t like being told what to do by people from away, and deservedly so. People from away don’t know our way of life,” Baber said. Dill discussed the importance of getting citizens involved in the legislative process and believes our state benefits overall from civic engagement and the referendum system. However, Dill also noted that he fears the intentions of out-of-state actors who dump excessive amounts of money into these races. Below is a table showing each candidate’s position on the five ballot questions Maine voters will face on Nov. 8. Baber opposes the passage of Question 1, citing research that shows the harmful effects it has on developing, adolescent brains. Baber also said that, appealing to the libertarian side of his political philosophy, he could support a measure like this if those who used marijuana would sign “an irrevocable pledge” never to go on public benefits. Dill will vote in favor of Question 1 but believes the legislature should consider possible tweaks to “wrangle in the law,” according to Dill. “Legalizing it is the best way to control it. I have to believe so many lives have been ruined for such a small amount of pot. I don’t see it at all in belonging [as a Schedule I drug],” Dill said. Dill endorses Question 2, but with reluctance. Because of his passion for education, Dill believes the state must fully fund its share of 55 percent of Essential Programs and Services for Maine public schools and does not know of a more practical solution than imposing an additional three percent surtax on incomes over $200,000. The additional surtax would set the income tax rate for Maine’s highest earners at 10.15 percent, or the second highest in the country. However, Dill acknowledged the potential problems this initiative poses for highly skilled workers, business and innovation. Baber opposes Question 2 for the same reasons. “It’s going to hurt our ability to bring capital to this state. It’s going to prevent us from bringing in people like doctors to this state. Let’s take a look at what we’re spending our money on before we add more taxes,” Baber said. Both candidates devoutly oppose Question 3, which would require background checks for all gun sales in Maine. Baber cited the legal concerns Question 3 poses with the Maine Constitution. Dill talked about his concerns with the fine print associated with the legislation, suggesting the Legislature consider revisiting this topic in the future with a less complicated proposal. “I believe in background checks on gun sales but I don’t believe in everything else hidden in that bill, so I can’t vote in favor of it” Dill said. Question 4 is another initiative that Dill supports, but again with reluctance. Dill is concerned that small business owners, specifically restaurants, will be hurt by this initiative, but calls on his peers in Augusta to help him amend portions of the ballot question during the next legislative session to tackle these problems. Baber disagrees with Question 4 because of the competitive disadvantages it will create for Maine, which competes with the other 49 states as well as the rest of our globalized economy. Baber and Dill both oppose Question 5, and both candidates acknowledged its presence on the ballot likely stems from Gov. Paul LePage’s reelection in 2014. Ranked-choice voting, according to Baber, is a solution in search of a problem. Dill says Question 5 is complicated and combats existing statutes in Maine law. “I think it’s too complicated and it’s going to be time consuming. If we don’t want to elect these people with less than 50 percent of the vote, we ought to build it right in that there is a runoff. That’s the easiest way to do it,” Dill said. Despite their differences on policy, District 5 voters face a tough decision to make with these two candidates. Regardless of whom they elect, the candidates they will choose from are among the best in the state. Both are devoted public servants and philanthropists who have made their living by helping members of their community. They are both respectful, well-rounded candidates who put priority in policy over political mudslinging. Additionally, they both ask for your vote in November.